Does it ever seem to you as if some days or weeks are filled with a never ending array of tasks? This work overload can cause stress and that in turn can be detrimental to your health. Project managers in particular need task management skills to be able to manage their team(s) and complex projects effectively. Task management is probably the first thing that comes to people’s minds when they think about what the job of a project manager actually entails. It is so important because you can improve productivity and lower project costs if you do it effectively. If there is one thing that is absolutely vital to be successful as a project manager, it is the ability to plan and manage tasks. Task management is closely connected to time management. The reason is simple: it takes time to perform tasks. But you can’t exchange one for the other. Time management is essentially the ability to use your time effectively. Task Management on the other hand is the ability to prioritize and focus on one task at a time and get it done. Essentially, it’s about managing tasks until you have completed them. The first step in task management is to make a simple to-do list, i.e. list all the tasks you need to do. This can be done on paper or digitally. This activity sounds easy enough, but it’s important that the tasks are not too broad. Instead of one big activity that will take a lot of time and effort to complete, you should break it down into more manageable parts. This way you won’t feel overwhelmed and also feel a sense of accomplishment when you can check off a task after you have finished it. You also have to decide whether you can do the tasks yourself or if it’s better to delegate them. The next step is to sort and prioritize the tasks that you have identified before. You can use the 80/20 (Pareto) principle or Eisenhower method to see which tasks are most important, i.e. generate the most value. Some tasks are more complex than others, and it will probably take you more time to finish them. Or you might dread doing some tasks (e.g. negotiate the budget for a project with executives). You should put the complex and dreaded tasks at the top of your list and do them first. This way you get it out of the way quickly (like taking off a band aid) and they won’t cause you any problems at the end. Have you ever tried to do more than one task at a time and ended up doing none of them properly? That’s the result of multitasking. Most people can’t multitask well. In fact, multitasking has more negative than positive effects. Switching between tasks prevents people from getting ‘into the zone’ or ‘flow’, which facilitates productivity and creativity. Instead people who multitask are easily distracted and get stressed because they can’t seem to finish any tasks. Effective task management means that you should complete one task and only then move on to the next. To-do lists are practical for planning your day, but when it comes to larger undertakings it is better to use software tools. Projects can get complex really quickly and a list on paper will get too confusing. Technology has made our lives much easier and we should make use of it. The InLoox PM 8 software, for example, allows you to create work packages and team tasks. 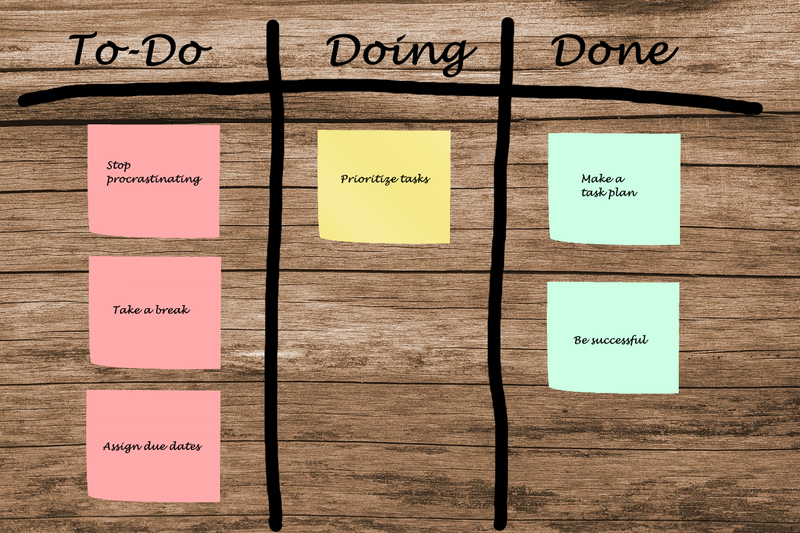 You can also track the progress of a task through the Kanban view, as well as visualize activities in Gantt charts which also show the dependency between them (critical path). Get Things Done With Task Management (Aspects of Project Management Part 4) - InLoox • Copyright 1999-2019 © InLoox, Inc. All rights reserved.